A system once designated for museum quality preservations is now available for your wedding dress. 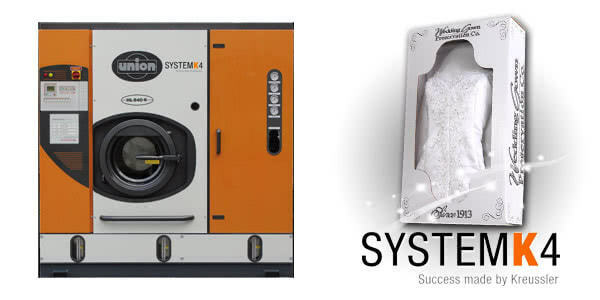 SystemK4 has caused quite a stir in the textile cleaning industry since its introduction several years ago. More dry cleaning companies than ever before are searching for ways to improve the quality of their cleaning systems while keeping the process eco-friendly. Before we get into how your treasured wedding dress can benefit from SystemK4, let’s talk about how garments were traditionally cleaned and cared for when being put through the dry cleaning process. The term “Dry Cleaning”, in all truth, is a little misleading. When you take a garment to be dry-cleaned, it does not actually stay dry during the cleaning process. It does indeed become wet, however, it is traditionally soaked with a cleaning agent called “Perc” or for the chemical geeks out there, “perchloroethylene”. Perc has worked so well that it has been used in the dry cleaning business for over 100 years. When you walk into any dry cleaning company that uses traditional dry-cleaning methods you can always identify a distinct odor regardless of what type of building the dry cleaning company was in or what part of the country they were located. That distinctive smell is due to the chemical Perc. Besides just smelling bad, Perc is also a notoriously hazardous chemical with some researchers even going as far as declaring it a carcinogen which can lead to cancer. The US government feels the same way and actually taxes dry cleaners to use the chemical in an effort fund potential hazardous spill that could potentially occur at the dry cleaning facility. A typical environmental cleanup from a Perc spill can range in the tens of thousands of dollars. So why do dry-cleaners still use Perc in their cleaning process when it is heavily taxed and extremely hazardous to the environment? There are a couple reasons. Perc has always been one of the most aggressive methods to treat difficult to remove stains such as oil, fat and grease. Perc has also been relatively inexpensive for dry cleaner’s to use as compared to other methods that had tried to compete with Perc such as Hydrocarbon. While Hydrocarbon was effective in treating oil, fat and grease, it would often take several cleaning cycles to treat the garment which means using much more of the cleaning detergent than a one-time Perc treatment. Then SYSTEMK4 came along and changed the game. SYSTEMK4, developed in Germany (of course!) was developed to be an effective system of cleaning garments that was 100% safe for the environment and rivaled the aggressiveness of perchloroethylene. Not only does SYSTEMK4 meet statutory environmental regulations, the developers have gone as far as going beyond the regulations and making the product absolutely harmless to humans. Even more amazing, testing has shown time and time again that SYSTEMK4 is a far more effective and powerful cleaning agent than Perc ever was. SYSTEMK4 was developed by the 100+ year old German chemical and research company, Kreussler Inc. The system is actually comprised of four main products: SolvonK4, ClipK4, and PrenettK4. SolvonK4 is the name given to the miracle solvent that comprises each component of the system. ClipK4 and PrenettK4 are all derived from the SolvonK4 product. ClipK4 is a highly concentrated dry-cleaning detergent which is used to remove most of the stains in your wedding gown, many that you can’t see with your naked high but can be very harmful to your gown as it sits in storage over the years. PrenettK4 is a brushing agent that removes difficult soil stains such as deep set icing stains or dirt around the hem line of your wedding dress. When combined, all the components of SYSTEMK4 make up a process that stains on fabric, and wedding gowns, can’t compete against. If you want the best treatment and the best results for your wedding gown, don’t compromise and choose the nation’s leading wedding gown preservation company. We’ve invested in the world’s most advanced wedding dress cleaning technology and have 100 years of industry expertise to insure your dress gets the royal treatment. Our technology combined with our expertise allows us to offer brides a 100 year guarantee against future yellowing.